Kwasi Gyan-Apenteng, President of the Ghana Association of Writers has been elected chairman of the 8th new constituted board of the National Media Commission (NMC). Mr Gyan-Apenteng who is a Consultant in Communication, Media and Culture was unanimously elected yesterday at the Commission’s first meeting held in Accra. His election came after the commission sworn-in eighteen members to form part of the newly constituted commission. Mr Gyan-Apenteng is a renowned journalist with over 40 years experience on the field with vast experience as an editor, columnist and writer. He began work formally as a journalist at Daily Graphic in 1982 as Staff Writer and subsequently became Foreign News Editor, later as acting Editor. Speaking during the swearing-in ceremony, Ambassador Kabral Blay Amihere, the out-going chairman of the NMC stated that the eighteen-member board was constituted in accordance with the NMC core mandate to defend the freedom and independence of the media; and to insulate the state media from governmental control. He urged the new commissioners and chairman to rise and work above narrow partisan considerations. 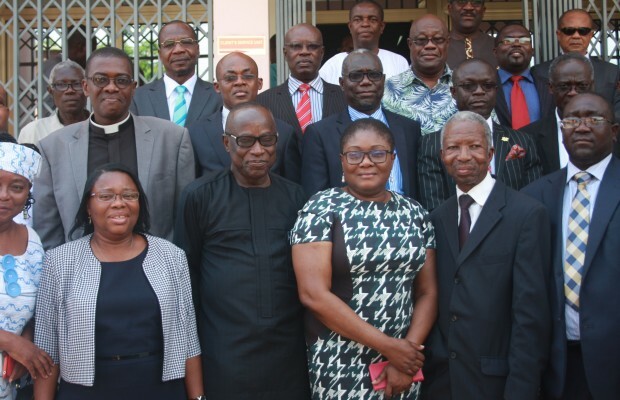 The newly constituted board is made up of media moguls like Mrs. Gina Blay, representing the Private Newspaper Association of Ghana (PRINGPAG) ; Samuel Attah-Mensah, representing Ghana Independent Broadcasters Associaiton (GIBA); Kwesi Pratt Jnr and Francis Kwarteng Arthur representing the Office of the President. Others include Dr Doris Yaa Dartey, Perry Ofosu, Fritz Baffour, Osei Bonsu Amoah and Richard Mawuli Quashigah- representing Parliament- , Kingsley Ofei-Nkansah, Apostle Abraham Ofori-Kuragu, Alahji Noor –Deen Saeed, Ernest Benjamin Kakra Essamuah, Nana Addo Gyau Akabisa II, Williams Orleans Oduro and Orlando Baeta. Ambassador Amihere stated that the 2016 Presidential and Parliamentary elections would test the greatness, strength and patriotism of many institutions including the media and therefore urged the media to be circumspect in their reportage during the elections. He announced that the NMC would relocate and operate from a new relatively more modern office complex located at the Switchback Road, Cantonments in Accra. “We hope posterity will deem this as one of the legacies of the 6th and 7th Commission but the real credit goes to His Excellency John Dramani Mahama who has delivered on a promise he made to the NMC during one of the meetings with him to ensure that the NMC operated from a suitable office space,” he said. Justice Joseph B. Akamba, a justice at the Supreme Court who supervised the swearing-in said the media should be guided by the NMC to ensure neutrality and balanced reportage to avoid the democratic gains and successes from being eroded.